Lenzy Family Institute Archives - SMART Management, Inc. This was our first year as an exhibitor at the National Conference on Addiction Disorders ( NCAD ). We would like to thank the Vendome Group for welcoming us to the 4-day event at Union Station Hotel in St. Louis. With 900 addiction treatment professionals in attendance at NCAD, this was an excellent opportunity for SMART to meet many professionals directly involved in the critical task of providing patient care. 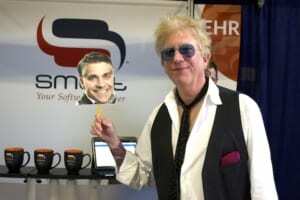 Learning about the needs of midwestern treatment facilities afforded us the opportunity to demonstrate and prove the compatibility and efficacy of SMART’s Software. 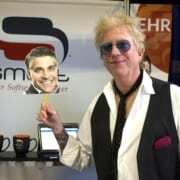 He later stopped by the SMART booth, met our staff and indulged us with a few fun photos! With the serious topic of addiction disorders on our minds, Homerun Henry (a.k.a Doug Edwards, Vice-President and Managing Director of the Vendome Group) helped to keep spirits light by sporting a St. Louis inspired classic style baseball uniform and posed with attendees including the grand-prize winner of the Fiat 500 give away. 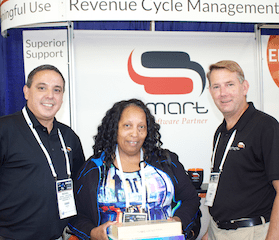 We were happily surprised when we were awarded third-place for Homerun Henry’s Most Exemplary Attendee Handout Awards…in short everyone really loved our SMART coffee mugs! We would also like to congratulate our Samsung Galaxy Tab S gift pack winner Elizabeth Lenzy, M.A. LPCC-S, Executive Director of The Lenzy Family Institute. The Lenzy Family Institute is a federally-qualified health organization providing integrated physical and behavioral health services. They work to promote abstinence and mental wellness for people affected by behavioral health disorders by providing substance abuse prevention, treatment, and recovery support services. The National Conference on Addiction Disorders ( NCAD ), along with Behavioral Healthcare Executive Summit, has rapidly established itself as a premier, respected, and trusted national conference that provides a diverse educational curriculum on the prevention, intervention, treatment, and recovery management of addictions that affect various genders, generations, and cultures.